This easy Lemon Chicken Piccata Casserole is a wonderful change from our classic chicken piccata recipe. An all in one dish including potatoes makes this an easy meal to serve to a crowd, with the classic flavors of lemon chicken piccata in the forefront. We love simple casseroles to help stretch our favorite meals further. 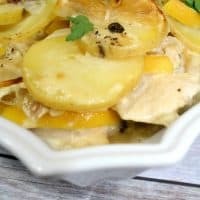 Lemon Chicken Piccata has a unique flavor that everyone in our family loves, but the addition of the thinly sliced potatoes in this casserole make it a perfect choice for me to prep in advance, pop into the oven and enjoy with my family after a long day. This casserole features many things we keep on hand all the time. 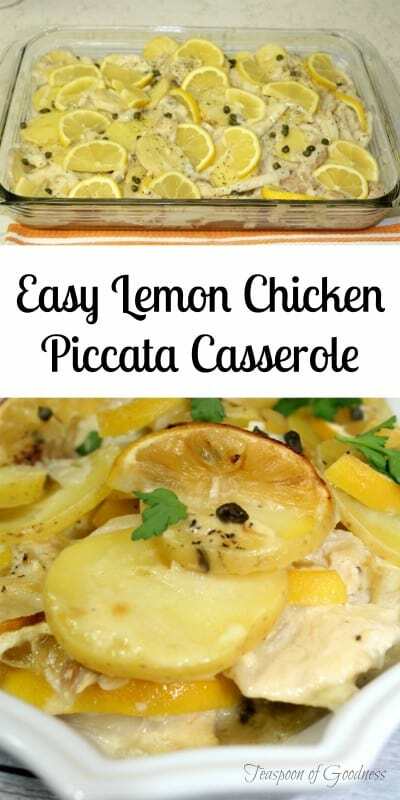 That means at the last minute, I can grab things from my pantry to create a delicious lemon chicken piccata casserole that even my picky eaters will enjoy eating. The classic combination of cream of mushroom soup and potatoes is a perfect base. 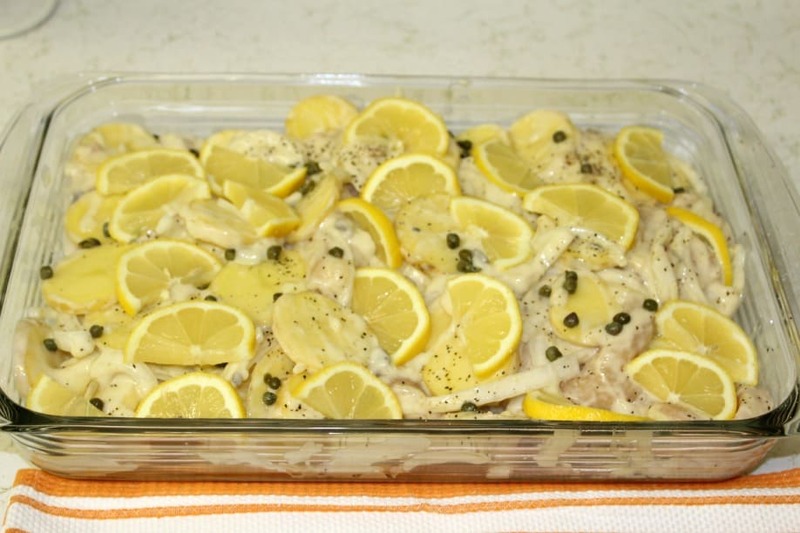 Adding in well-seasoned chicken with layers of sliced lemons and the classic capers of a piccata chicken recipe makes it an ideal choice for an upscale casserole dish. 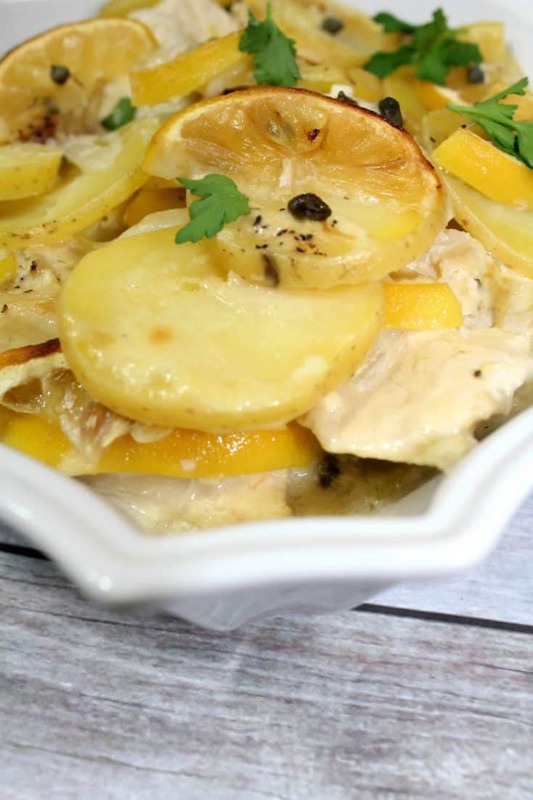 Forget the casseroles of your childhood and embrace the delicious flavors of this Lemon Chicken Piccata Casserole for a sophisticated, kid friendly delicious meal. Add condensed soups and milk to a saucepan and whisk to combine. Heat over medium-high heat until simmering, stir frequently. 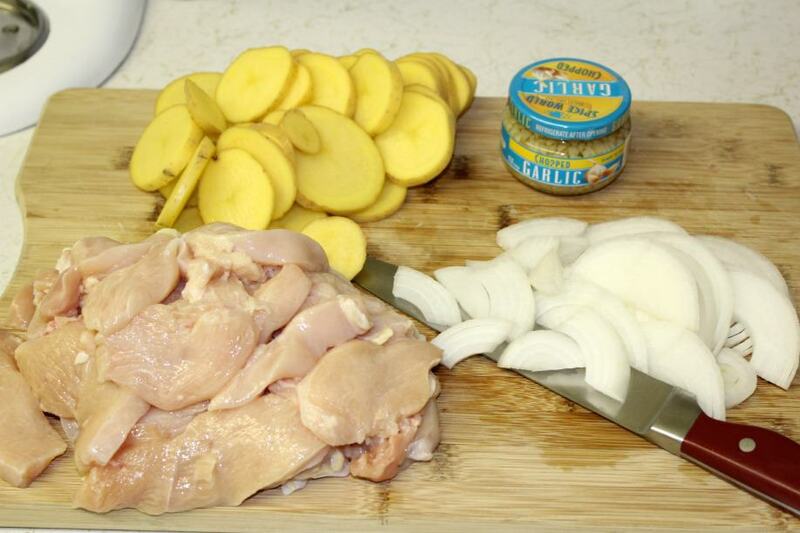 In a separate bowl, add potatoes, onion, garlic, and chicken. 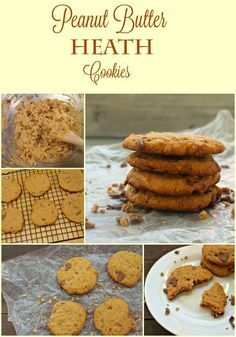 Combine all of the potato and chicken mixture until it is evenly coated. Pour the mixture into a 9 x 13 baking dish. 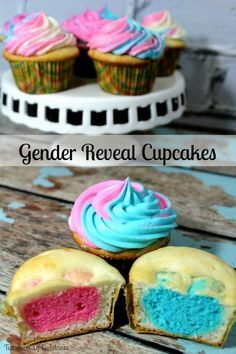 Layer lemon slices into the mixture randomly. Sprinkle top of mixture with Capers. Then cover the top of the casserole dish with aluminum foil. Bake for 1 hour and 10 minutes or until the potatoes are tender. 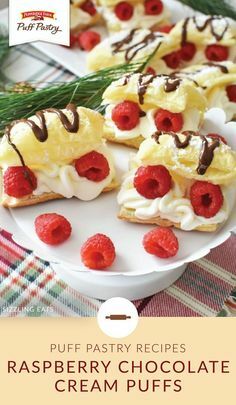 Carefully remove the foil, and change oven to "broil". Broil the casserole for an extra 2-3 minutes to crisp up the top. Remove pan from oven and serve warm.